Syma X5UW Drone Review 2019 – is the Syma X5UW quadcopter worth the money? Review of features, pricing, flight duration, battery, camera and more. Syma is one of the most popular Chinese drone manufacturers that offers a wide range of highly recommended models. The drones are well suited to novice users. One of its best models is the Syma X5UW that boasts an aerodynamic design with a gyroscope and other features aimed at new users. The Syma X5UW is delivered in a large cardboard box that contains an array of components and accessories, including batteries, SD card and more. The packaging keeps the product well protected so that it reaches the end user without damage. The unit’s control has an attractive design and the center features the power button. The X5UW is fitted with two four-way joysticks and four buttons on the back handle advanced features, such as the Flip 3D that allow the drone to perform a somersault. On the back, there is the cover for the four AA batteries and the anchor to place the clip that holds the smartphone. The Syma X5UW Drone has a bright red color that could remind some users of the Ferrari. This can be viewed as a way for the manufacturer to boast about the speed that the drone is capable of reaching. The propellers are white, which breaks a possible excess of the red color. At the top of the drone, you will find the logo and the power button, both in silver. At the bottom, the LED lights are positioned in a way that ensures that the drone is visible at night. The bottom part of the body also features an anchoring system for the camera module and a four-pin connector for its power and operation. There are two arrows that indicate the direction to turn the piece into a fixed position. The camera has a resolution of 1 MP and a slot to insert the memory card. 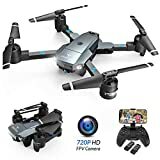 The camera comes with Wi-Fi technology, which enables the user to monitor the drone live from a smartphone because the controller has no screen. By inserting a memory card, it becomes possible to save videos and photos on the smartphone, something that could cause lag. The resolution of the video recording is 720p. The Syma X5UW has a flat design that improves aerodynamics and allows you to fly for longer. However, its batteries are small and they have a capacity of 500 mAh so the flight time will be modest (about 8-10 minutes). Although this aspect places it a notch above many of its rivals but the flight time is not exceptional. On the upside, the manufacturer includes two batteries, which allows users to extend the flight time. Each battery takes about an hour to charge. The batteries can be easily replaced at the back of the drone by pressing lightly to remove the battery before replacing it. The Syma X5UW has a 6-axis gyroscope for greater stability during flight. 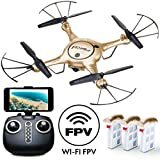 Remember that it is a drone aimed at novice users. It also has a barometric pressure sensor that allows you to use the altitude hold mode or altitude control. This enables the device to keep flying at a fixed height above the ground. Another function aimed at inexperienced users is the headless mode that basically allows users to fly without having to worry about the orientation of the device. If the user moves the control joystick to the right, the drone always goes to the right regardless of its orientation. These functions also help users capture video images of the landscape easily. The one-touch takeoff and landing function allows users to take off and land with just a push of a button. This is particularly useful for beginners who are keen to take advantage of a smoother way to handle takeoffs and landings until they get used to the controls. Pressing the button while the drone is on the ground enables it to rise to an approximate height of 59 inches. Android and iOS users can benefit from the Syma GO application, which makes it easier to monitor the camera and control the drone directly from the smartphone without the need for the control command. It also allows users to draw a route on the screen for the drone to follow. 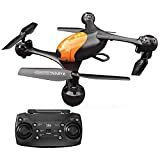 Syma X5UW review articles or user feedback posted online shows that the majority of beginners find the drone impressive. They highlight speed and stability as its key strengths. The Syma X5UW is undoubtedly one of the best drones for novices that you can find on the market. It is equipped with numerous technologies, which make it stable and easy to handle even for users who have no experience. Its flat design improves aerodynamics and reduces friction so that battery consumption decreases significantly and allows you to fly for longer. The Syma GO application for Android and iOS enables users to follow the camera’s vision in real time. In addition, it provides the possibility of operating the drone directly from the smartphone although using the included control command is more convenient. 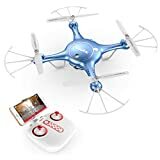 Some of the key specifications to consider when buying a drone include an internal six-axis gyroscope, flight range, a barometer, 2.4 GHz wireless remote control, flight time and compatibility via application (Android and iOS). Manufacturers offer devices that can be operated using a remote controller, which provides easy control and a fast response to commands. However, this does not allow users to view images and flight data. This is vital when recording videos. 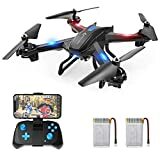 Thankfully, you can simply integrate the smartphone and use the appropriate application that can be connected to the wireless network generated by the drone itself.